An Easy Way to Remove Watermark From a Photo. It often happens that you see a nice picture that will perfectly fit your personal design on one condition: a watermark on it must be removed. Leaving the watermark in place will look quite ugly so there’s no other choice really. So then you're left wondering how to remove watermark from a photo leaving smooth and clean surface. You can either crop it out but then the picture will be crippled and won’t look as you wanted it to. You can also try and remove it in some sort of photo editor, by erasing it and blending the spot into the background, but that doesn’t seem like an easy task (and it isn’t). Thirdly, you can order to remove watermark in a design agency by a professional designer but that would take a considerably longer time and more money that you might expect. Plus, for just one or a couple of pictures? Worth the effort? Not really. Fortunately, the modern technology has advanced to the point that you can remove watermarks safely at home and by yourself, no help needed. Softorbits offers you a much better answer to all your questions than you can imagine – use Photo Stamp Remover to make your photos free from any unwanted elements, including watermarks, stamps, logotypes, text labels, etc, it’s easy, quick and doesn’t require any skills or talents. A watermark is often large, covering important details of the original photo, and removing it usually requires a lot of manual work. For example, if a watermark is on somebody’s face (these things happen, trust us!) or on a complex background that cannot be easily recreated. In these cases you can launch Photoshop and prepare for a long and tiresome quest of deleting watermarks manually, but Photo Stamp Remover from SoftOrbits does the entire job by itself. You only need to select the watermark area roughly, and the program will analyze the selection and clean it from the watermark overlay. The process is quite simple for the user and requires only a couple of easy adjustments for outputting clean, ready-for-use photos and images and these adjustments won’t take up much of your time. 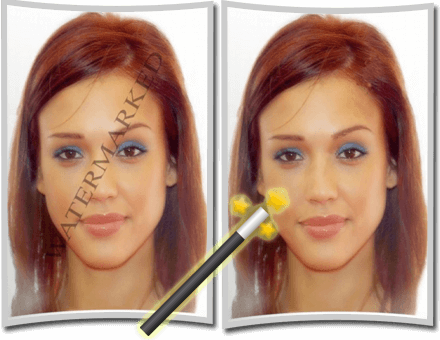 Photo Stamp Remover has unique AI algorithms built-in its core and allows finding and removing watermarks with minimum intervention. You won’t damage your picture, no worries! Please follow the steps below to successfully remove watermarks from your pictures. Step 1. Load photos into the program using an "Add files" button. You can start with one but there’s also an option of adding multiple files at once and use Batch Mode later on. Step 2. Select the area filled by a watermark with the aim of a "Selection Marker"
(it’s the pencil icon in the Tools section). You can use Rectangular or Color Selector as well to select the rectangular area and then click on the watermark in any place, the program will automatically highlight it. You can also save the selection in the form of a mask to use it later for other pictures with the same watermark. To use it once again, just click on the Load Mask icon and it will be automatically applied. Bear in mind that the mask will only work on the pictures of the same size and with the same watermark. Step 3. If you make a mistake - fear not, the selection can be cleared by clicking on Clear Selection and you can start again anytime. This can be repeated indefinitely. Also, if you make a mistake later on, when you’ve gotten the result, click Undo and the damage will be undone. Step 4. Select the Object Removing mode. We’re not going to bore you with technical details about each mode, you should try each mode for yourself as there are different pictures and certain modes might work better with certain pictures, it all depends. Step 5. Once the watermark is selected and the removing mode is picked, choose "Remove" option to erase the watermark. Wait just a couple of seconds (depending on your machine though). You can compare the result with the original photo by clicking on the Original button. Toggle the view by pressing the button and you’ll see the changes. This simple but highly powerful watermark remover offers cleaning photos in batch mode, as mentioned before, meaning that all required shots can be processed at once, if their watermarks are similar. This helps to spend minimum of your time for this routine job, just use Batch Mode and upload all the photos you need. You can also use Mask feature here and make it even easier for you, just load the pictures, the mask and the job will be done quickly. There are more tools in the program, such as cropping, various types of brushes to clean up the pictures, such as Smudge brush and Concealer brush.Plus you can do clone stamping, in case you need to clone objects on the picture, there’s no need to turn to Photoshop for that, all can be done within the program. Your picture will be looking much better if you use the additional tools but of course it’s not exactly necessary, it’s all up to you. There’s no messing around and looking for other solutions, there are no worries and instead it’s just doing the job. Photo Stamp Remover is an affordable helper for personal and professional needs. You can select different licenses and you are more than welcome to test its features using a free trial version and later on you may decide whether you’d like to purchase a full version or not. Trial version will let you see the results fully, no annoying half-pictures with no real result to be seen. Try it and Photo Stamp Remover will most likely prove itself useful for your needs. Good luck!